An introductory guide to smoothing techniques, semiparametric estimators, and their related methods, this book describes the methodology via a selection of carefully explained examples and data sets. It also demonstrates the potential of these techniques using detailed empirical examples drawn from the social and political sciences. Each chapter includes exercises and examples and there is a supplementary website containing all the datasets used, as well as computer code, allowing readers to replicate every analysis reported in the book. Includes software for implementing the methods in S-Plus and R.
Luke J. Keele – Department of Political Science, Ohio State University, US Since acquiring his PhD, Dr Keele has published work in a number of international journals, including papers on this specific topic. He has also taught the material for the proposed book at Ohio State University and presented it at international meetings.Dr Keele is a political scientist by trade but has considerable experience in applying statistical techniques to social science applications. 1 Introduction: Global versus Local Statistics. 1.1 The Consequences of Ignoring Nonlinearity. 1.3 Nonparametric and Semiparametric Techniques. 1.4 Outline of the Text. 2 Smoothing and Local Regression. 2.3.2 Polynomial Degree and Weight Function. 2.3.3 A Note on Interpretation. 2.4 Statistical Inference for Local Polynomial Regression. 3.2 Other Spline Models and Bases. 3.2.1 Quadratic and Cubic Spline Bases. 3.2.4 Knot Placement and Numbers. 3.3.2 Splines as Mixed Models. 3.3.3 Final Notes on Smoothing Splines. 4.2 Splines and Automated Smoothing. 4.2.1 Estimating Smoothing Through the Likelihood. 4.2.2 Smoothing Splines and Cross-Validation. 4.3 Automated Smoothing in Practice. 5 Additive and Semiparametric Regression Models. 6.4.1 Logistic Regression: The Liberal Peace. 6.4.2 Ordered Logit: Domestic Violence. 6.4.3 Count Models: Supreme Court Overrides. 6.4.4 Survival Models: Race Riots. 7 Extensions of the Semiparametric Regression Model. 8.2 Bootstrapping – An Overview. 8.2.2 An Example: Bootstrapping the Mean. 8.2.4 An Example: Presidential Elections. 8.3 Bootstrapping Nonparametric and Semiparametric Regression Models. 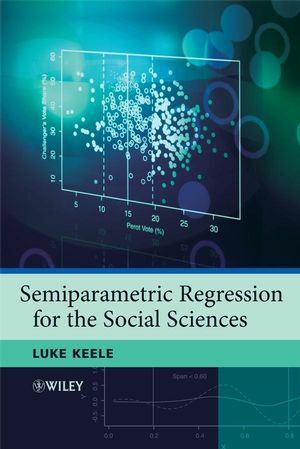 Semiparametric Regression for the Social Sciences Visit the website to access further resources discussed in this book.